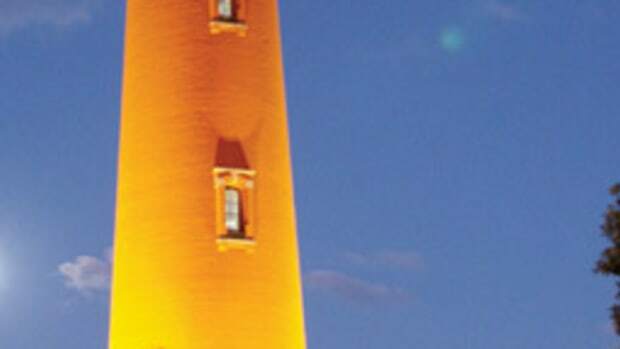 St. Augustine, Fla., is a convenient stop for sportfishing skippers and bluewater sailors making passages off the Eastern Seaboard. 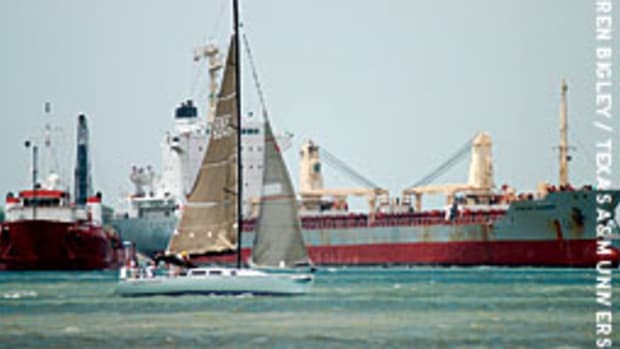 But shoaling in St. Augustine Inlet has led to the grounding of several yachts — power and sail — in the last year, Blow says. Last November, TowBoatU.S. 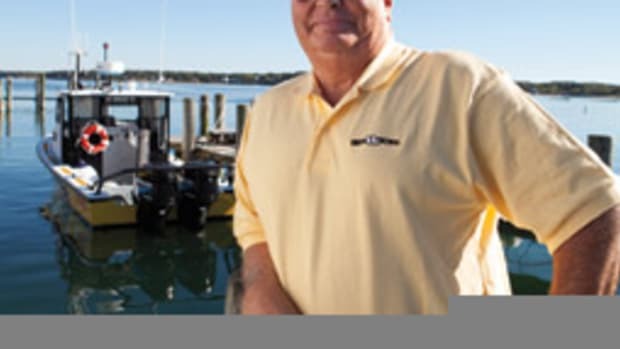 captain Norm Manley capsized while trying to yank a sailboat off the shoal, and he spent more than three hours in the water and nearly drowned (see the March issue of Soundings). 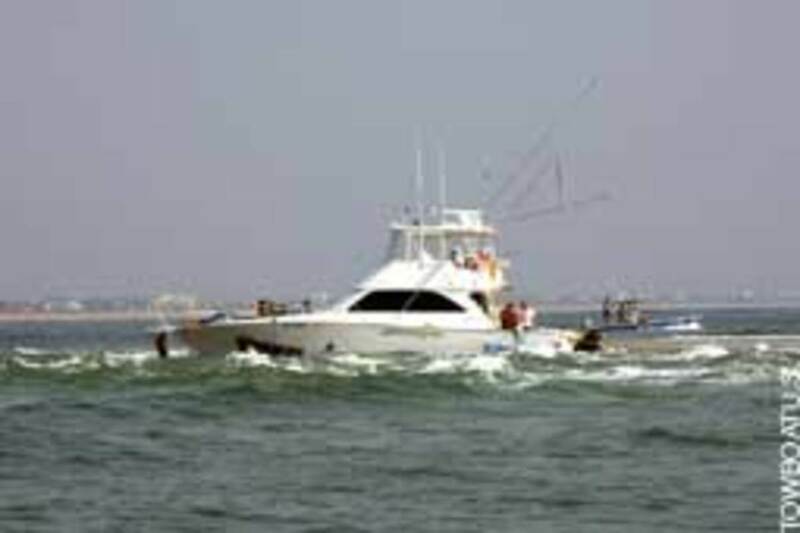 This spring, a 48-foot Viking convertible hit the shoal. 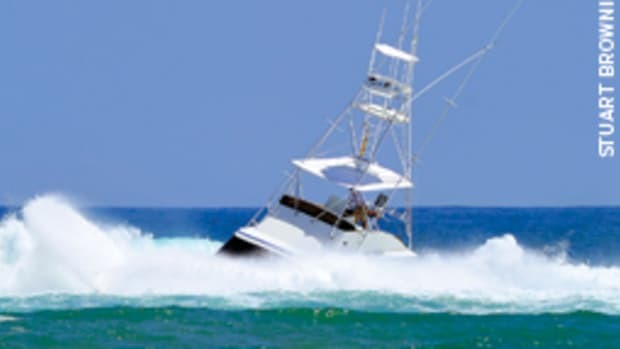 The impact damaged its props and running gear, and surf pounded the sportfishing boat for three days before it could be ungrounded, smashing a saloon window and destroying the interior. At high tide, only the flybridge was visible. The 50,000-pound Viking’s weight nearly doubled with the sand and water it took on during those three days, Stebleton says. TowBoatU.S. workers used about eight air bags — 44,000 pounds of buoyancy — to raise the yacht, he says. The hull was undamaged, Stebleton says. “Once it was pumped out and under tow, we never started a pump again,” he says. 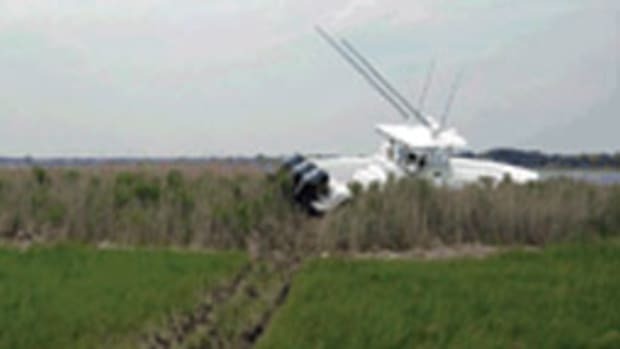 The three people on board were unharmed. 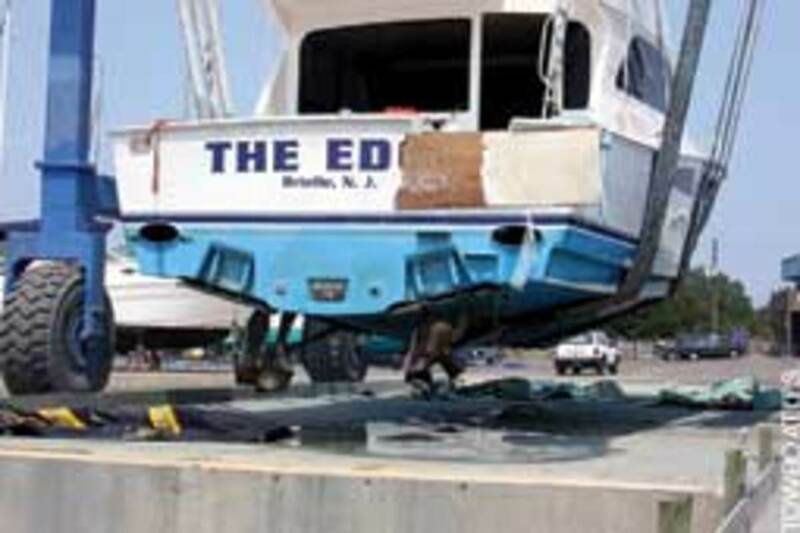 A charter company from New Jersey owns the Viking, named The Edge, according to St. Augustine officials. At the owner’s request, TowBoatU.S. did not provide the names of the company owner or the people on the boat. In addition to the captain, who is a man in his 50s, two passengers were aboard, a woman and a man, also in their 50s, according to Jeremy Robshaw, public information officer for St. Johns County Fire and Rescue. (Robshaw was part of a six-person team of rescuers who found Manley.) The Viking grounded about 5:30 p.m. May 5, just south of the inlet entrance and east of its south breakwater, Robshaw says. Waves were 2 to 4 feet, and winds were 15 knots. 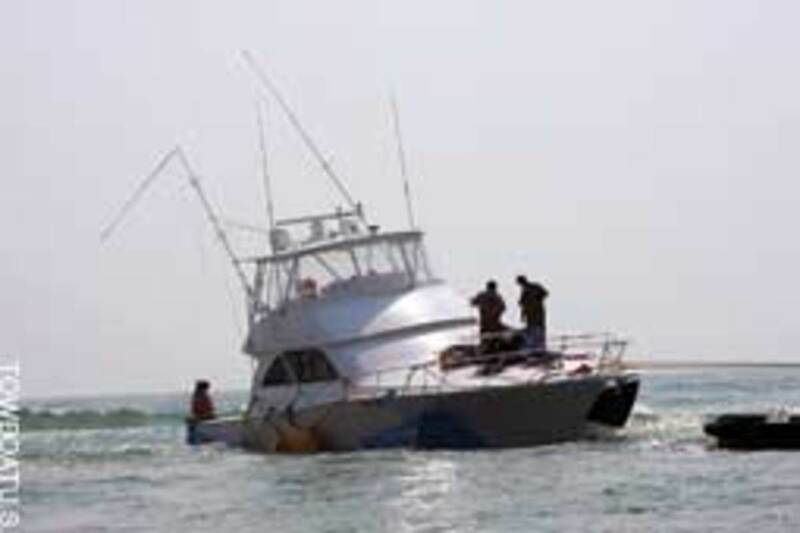 The shallow water and building surf made it difficult for the salvors to safely tow the boat, he says. “They decided to wait until the tide came in some so the vessel would float and they could work from there,” he says. But the breakers became more violent, and the Viking began to take on significant amounts of water and was listing to starboard, Robshaw says. “The female indicated to the towing operator that she wanted off of the vessel,” he says. The only vessel on scene that could safely approach the Viking was Fire and Rescue’s personal watercraft. Even then, the task was tricky. “The only place to board the vessel was at the stern, and that’s where the surf was pounding the boat,” says Robshaw, who was the rescue swimmer for the operation and a passenger on the PWC. 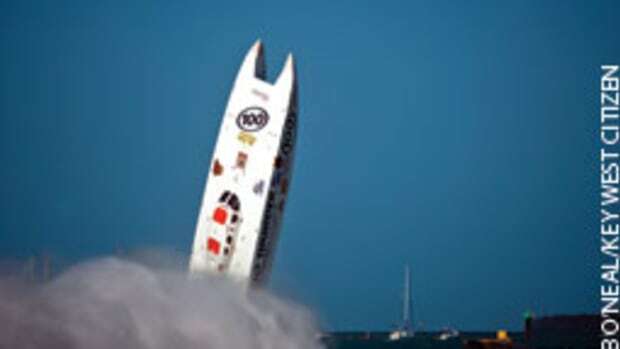 Robshaw and the PWC operator — Fire and Rescue Lt. Dan Power — came alongside the Viking, and Robshaw jumped into the cockpit. He tethered himself to the woman, and they jumped into the water and swam away from the boat so the PWC could pick them up. The two men wanted to remain on board, but a short time later the Coast Guard, which was not on the scene but was being updated over VHF radio, gave the order to get them off the boat. “The weather started to kick up and the boat was taking on water, so we said, ‘Let’s get the folks off and worry about the salvage issue later on,’ ” says Coast Guard Cmdr. Patrick Schreiber, chief of response for Sector Jacksonville. Robshaw and Power performed the same procedure with the two men that they used to rescue the woman, one at a time, Robshaw says. The 49-footer is expected to arrive in St. Augustine in early August and the job should be completed a few weeks later, Lehmann says. “We’re going to have to take the entire channel and shift it to the north/northeast to make sure we are marking the best water properly,” he says. The Coast Guard last October placed a temporary green buoy (5A) on the south side of the inlet, just north of the two permanent green buoys. After the Viking grounding, the Coast Guard placed another temporary green buoy (5B) in the area. “These are small buoys and not the buoys I would prefer to put there, but given the assets that we have to work with that is the best we can do right now,” Lehmann says. The temporary buoys have been doing the job for the most part, Blow says. “But if you’re coming in the inlet you are typically in a following sea, and you might not be able to see those [temporary] buoys,” he says. The long-term solution is to dredge the inlet, says Jim Piggott, who as the director of general services for St. Augustine oversees the city-run marina and mooring field. St. Johns County is expected to dredge the area around temporary marker 5A and a second problem spot at Porpoise Point on the north side of the inlet entrance, Piggott says. Local waterfront residents fighting a portion of the proposed dredging — they say it will cause erosion of their land — may delay the dredging, but it should begin in nine to 12 months, regardless of that effort, Piggott says. St. Augustine is packed with recreational boats from 20 to 120 feet, says Sam Adukiewicz, the city’s harbormaster. The St. Augustine Municipal Marina has 90 slips, and there are 165 city-owned moorings, two of which can hold boats to 120 feet, Adukiewicz says.